If you missed part one, click here to determine if pressing vinyl is the right choice for you and your music. "I've never not had a turntable, and my records have never been packed away," says Record Store Day co-founder Carrie Colliton. "I really like the ritual of it, how you have to pay attention to it when you're playing a record, and you have to interact with it." Vinyl is back in a big way – and both artists and consumers are excited for the same reasons: vinyl, despite its limitations, gives the listener so much more, reveling in each nuance, discovering new nooks and crannies in the larger-than-life sound, and decoding the masterpiece of your choice with the aid of liner notes and cover art. "The frequency range of a record closely mirrors that of what you can hear," explains Jay Millar, marketing director of Nashville's United Record Pressing. "But even in situations where I know something is sourced digital, there is a certain unexplainable sound that can only come from the needle physically interacting with the media." 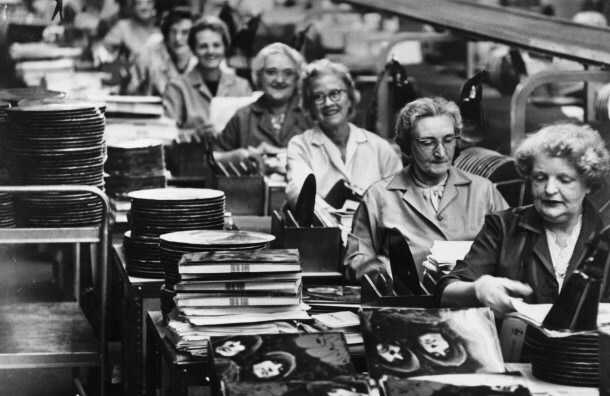 There's a lot of work that goes into getting a record pressed. In part one, I touched on some things that you'd want to consider before even striking out on such an endeavor. Here's what you need to do to get things moving. A few points will be reiterated and expanded upon because, well, they're important. Pressing vinyl is delicate process, and there are many moving parts involved – both literally and figuratively. And each of these parts comes with a price. First off will be mastering your record – something you may only need to do once (more on that below), though making a separate vinyl master might be to your advantage. That price may vary, so you'll want to have that discussion with the engineer of your choice. Once the album is mastered, the music will be cut to a lacquer disc by a lathe, creating the grooves that hold your music. That disc will then be "plated," a process where the metal parts needed to physically press your record are made. Along the way, you'll have a chance to hear how things sound via digital files, a CD, or by making some sort of reference lacquer or dub plate. The digital references will likely come free of charge, but the lacquers and dub plates will come at a significant cost, so depending on your budget, you might want to have faith that your master is in good hands. Sometimes your mastering engineer can provide these services but, more than likely, the pressing plant will help you through this process. Once the records go to press you'll be provided with test pressings (usually five copies) that you can use for quality control. These test pressings will be your last chance to get an idea of how the vinyl sounds and whether or not you'll need to make any changes before it truly goes to press. This process alone might set you back somewhere between $300 and $1,000. The cost of actually manufacturing the finished product depends on a number of variables: weight, color, quantity, stickers, sleeves, artwork, shipping, etc. Every plant handles these things a different way, so the best thing to do would be to research these costs online via their websites. Then you can add up the different scenarios and see what's best for you. Some plants, like United, have helpful tools like an online calculator. And if you're really feeling lost (which is totally understandable), get on the phone and hash out your concerns with a real live human who might be able to help get the most bang for your budget. That said, expect to spend another $1,000 to $2,000. For a full-length record, most pressing plants suggest you keep the music to around 20 minutes per side. Less is best. More is risky and makes you more prone to quality control issues. So if you're planning on releasing an ambitious rock opera, then you should go for a double album. If not, then do our media-saturated world a favor, and keep your magnum opus under 40 minutes. Sequencing is important to the flow of any album, but with vinyl, other considerations need to be made in regards to the dynamics of your songs. Ever notice that classic albums tend to start each side with more dynamic songs and end with more subdued numbers? There's some drama involved, sure, but it's also about circumference: at the beginning of the record, there's more room for the grooves that hold the music. The space gets tighter as you move towards the center – and less room for grooves (which move the needle back and forth) means less dynamics, so it's the perfect place to put that gentle acoustic number. "Mastering is the final step in creating a finished product for release," says Logus. "I am your sonic guardian angel." Since vinyl is such a delicate process, it's understandable that you might want to make a separate master than what you'd use for CDs and MP3s. The reasons for this come down to understanding the nuances of the intricacies of cutting LPs. "Most modern CDs and tracks are made loud by reducing the dynamic range, the 'average to peak level,'" says Logus. "Vinyl has its own and very different ceiling. It reacts much better to dynamics and gets more interesting when the cutter head is moving a lot. You can actually hear the music from the cutter head without any speakers at all! When it sounds good like that, it'll sound spectacular when played back on a turntable." But if making a separate vinyl master isn't in your budget, then a well-done digital master should – and often does – suffice. "The reason I encourage people to do it is because I think we've all collectively (and regrettably) agreed to participate in the loudness war to some degree or another," says Daniel Farris, a producer and engineer who counts St. Vincent and Man or Astroman? among his clients. "So you master the CD (and/or files for iTunes) as loudly as you can reasonably make them without destroying them, because you know everyone else is doing the same. But this processing compromises the sound quality of the music, mainly the dynamics. "The beauty of vinyl is that these concerns are gone because, at least according to my theory, your music isn't being heard up against other people's masters. The idea, at least to me, is that every time someone puts a new platter on the deck, they readjust the volume to suit that record. So you never compete. To me, this seems like the perfect opportunity to bow out of the loudness war and make a master that is (while nowhere near as loud as the CD/digital files) fully dynamic and uncompromised by loudness processing." Whether or not you make a separate master, you'll want to make sure your music is in the hands of someone who knows what he or she is doing. Many of the pressing plants offer suggestions on what works best for them on their websites, so be sure you and your engineer take the time to read them over or talk to a customer service rep before making a costly mistake. "There is no substitute for the visual experience of a record," says URP's Jay Millar. "From the packaging and the larger artwork to the joy of just watching it spin. Plus, vinyl can have surprises that way. Maybe you open that record and are excited to see that it's on a unique color of vinyl, and that they printed on the inside of the jacket pockets, too." Whether or not you think vinyl sounds better than CDs or MP3s, listening to it is a more immersive experience. The artwork has always been a part of that experience. Today, even as more people stream music rather than own it, artists still care about the visual representation of their music – and vinyl's newfound popularity allows you to make those images as big as your music. Not only can you focus on a striking cover image, but also the insides of the record – sleeves, inserts, download cards (more on that below), or even a CD. Of course, all of these components come at a cost and each pressing plant will provide you different options and pricing. Whether your pressing 300 or 1,000 albums, most of the upfront costs involved with pressing a record (lacquers, plating, etc.) don't change, but that's not the case when pressing artwork – the more you make, the better the price. So, if you think you're sitting on an album with some legs, then it might be advantageous to print more art than records, and hold onto the excess materials until it's time to press more wax, thus saving time and money in the long run. Those on a smaller budget will do best to combine as many elements as possible. Rather than print a separate insert with liner notes and lyrics, consider printing these on the sleeves themselves. Or you might want to just have plain white sleeve and put the liner notes on the back cover. Want to get more hands on? Get the records pressed on plain white jackets and make each album a homespun work of art via screen printing, painting, or collage. Right now, the toughest part about getting a record made is actually finding the place to make 'em. Pressing plants in the US and in Europe are feeling the pinch of the vinyl boom, which is to say business is great, but they're all running at full capacity. Record Store Day has added to the madness. This year, the annual, worldwide event (which took place just a few days ago on April 18) featured 592 official titles which, understandably, causes quite a logjam at the pressing plants. Now a process that might take a few weeks takes, on average, three to four months. So, if you plan on touring around the release of your new LP, you'll want to plan accordingly and consider getting your album pressed in late spring or early summer. Some speculate that the vinyl boom may be a fad – and they could be right – but that's not stopping a few enterprising souls from jumping into the game. United is currently expanding its operation from 22 presses to 38. In nearby Memphis, Fat Possum Records has opened a plant of its own, Memphis Record Pressing, featuring nine presses that can crank out 7,000 records a day. San Francisco's Pirates Press recently partnered with a plant in the Czech Republic to build the first new record press since Reagan was president. Most plants do all their pressing on-site, but there are also companies like A to Z Media (which counts Radiohead among its clients), Furnace Record Pressing, and recordpressing.com who are vinyl brokers, meaning they help find a plant to suit your needs. It's also worth researching plants in the UK and Europe – these plants typically have more presses than those in the US and can offer competitive rates (though the shipping costs will likely be more expensive). Vinyl is a joy unto itself, but if you really want to offer value to your fans, then you should include a digital version with the LP. This is usually achieved by including a slip of paper featuring a URL as well as a unique code. Some pressing plants will offer this service, even hosting the site where fans can download the songs. There are also companies like Dropcards that offer a similar service as well a variety of options for artists who want to include something more adventurous than a mere slip of paper. You might also use this opportunity to collect email addresses of your fans so you can keep them abreast of news and tour dates. Feeling really generous? Include a CD (or a CD-R) so your fans can enjoy your magnum opus while they're making their way back to the sanctity of their listening room. Overwhelmed? It's understandable. But if you've come this far to make an album that you're truly proud of, then this extra effort will be worth it – just make sure it's right for you. Besides the financial investment, records take up a lot of room, and you don't want your home, much less a record store, to be stuck with 'em. Of course, if making 500 or 1,000 records is more than you can handle, there are alternatives like lathecuts. Or you could just make cassettes, but that's another story. Now that you've got the 411 on vinyl, find out the best (and worst) months to release your new record. Happy spinning! James P. Fahy is a writer, musician (Teen Getaway), radio show host (Blood on the Knobs airs every Tuesday on Substrate Radio), occasional publicist, full-time dad, and music business person who's worked with the Coalition of Independent Music Stores, Communicating Vessels, Naxos, and Redeye Distribution. He lives in Birmingham, Alabama.